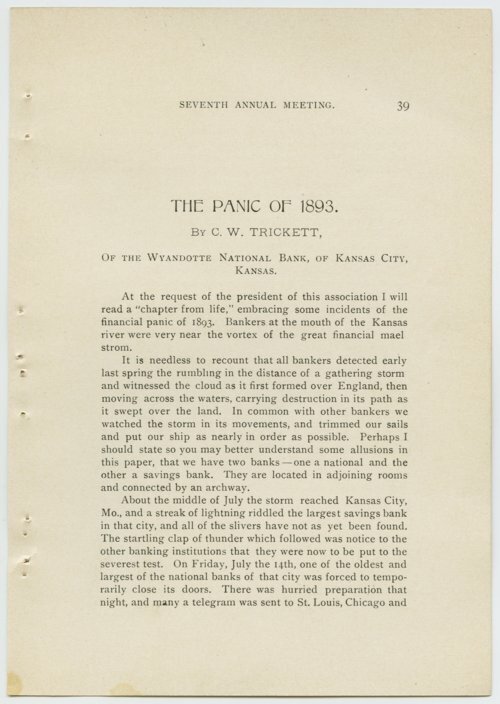 This speech on the financial crisis (or "panic") of 1893 was written by C. W. Trickett of the Wyandotte National Bank of Kansas City, Kansas. It was published in the Seventh Annual Convention report of the Kansas Bankers Association. In the speech, he relates how during the economic depression that occurred that year, patrons of the bank flooded through the doors to withdraw their savings and banks were forced to close. Trickett offers up some of the conclusions he has drawn from this crisis and encourages his fellow bankers to take heed of these lessons.